The eyes are your windows to the world. They can reveal your innermost feelings and emotions, your joy and happiness, your sorrow and sadness. Youth, beauty and wisdom may be fownd here also. To many, their sight is the most important of the senses yet to some, eyes are a continuous source of irritation and discomfort. Consequently, their eyes do not produce enough tears to be wet and comfortable as a result of a condition known as Dry Eye Syndrome. Knowing about dry eye syndrome and symptoms today can help avoid potential issues and complications in the future. Each time you blink, new tears bath the surface of your eye. These tears are formed in several glands located around each eye. The Large Lacrimal Gland responds to emotion, injury, irritation, whereas the Accessory lacrimal Glands secrete an anti-bacterial agent to help ward off infection and constantly lubricate and comfort your eye. Small openings in your upper and lower eyelid are referred to as tear ducts, or medically identified as puncta and act as tear drains. 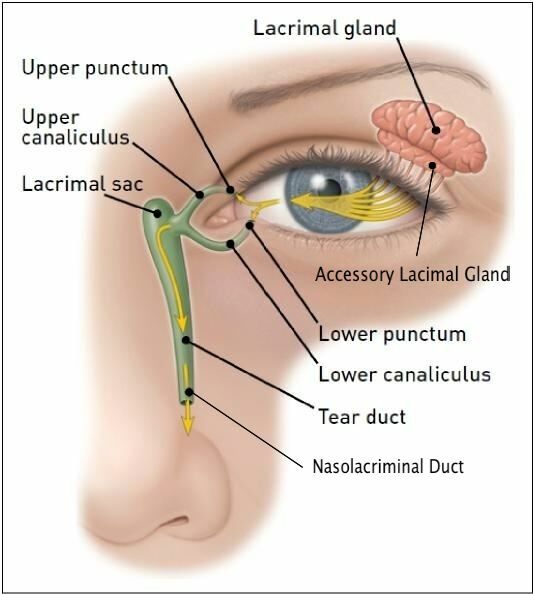 The Lacrimal Sac allows tears to flow from your eye to your nose. The Nasolacrimal Duct is a continuation of the lacrimal sac into the nose to permit drainage. Tears are produced to soothe and protect your eyes. The Lipid Layer is the outer- most oil-based layer rapid tear evaporation.which helps to minimize. The Aqueous, or middle layer, contains salt and protein in a 98% water base. 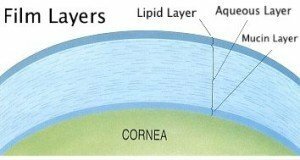 The Mucin Layer coats the entire surface of the eye which causes the lipid and aqueous layers to form. If any one of these important layers is missing, or when only a few tears are being produced, a breakdown occurs which may cause burning, stinging or itching sensations. These are symp­toms of Dry Eye Syndrome. Contact lenses, cigarette smoke, pollution, drugs and medication, some work environments, the exposure to atmospheric conditions like sand, dust, and low humidity. Even pregnancy may cause Dry Eye Syndrome. As we grow older, our tear production typically decreases. After menopause, women are especially susceptible to the symptoms of Dry Eye Syndrome. Of course men and women of any age can be affected. Determine any degenerated cells or breakdowns in the tear film through application of eye drops. Next, the quantity of your tears could be tested. Using a Color Bar Schirmer Test, the tip of a treated, calibrated strip of paper is placed in the lower lid of your eye to measure the amount of tears produced during this painless, five minute period. The third method involves temporarily closing the tear duct (punctal) canal. A small Collagen Plug is inserted into the tear duct until it completely disappears just below the opening, thus acting like a stopper in a sink. This will prevent tear drainage, causing your own tears to bathe the eye for a longer period of time. In about a week, this plug will dissolve and wash away with your tears, thus allowing you and your doctor time to evaluate if permanent closure may be required. The procedure is generally painless and often takes only a few minutes to perform. Should one experience any discomfort, your doctor may simply apply a topical anesthetic by a drop or by a cotton swab. Frequently, Dry Eye Patients find immediate temporary relief with artificial tears. This treat­ ment may serve as a quick remedy, but artificial tears are only a temporary or short-term solution to the problem. While artificial tears may be considered for some less severe Dry Eye cases, in more serious instances, permanent closure of the tear duct may be the best solution. This would allow you to retain your own natural tears. Today, there are three basic methods of tear duct closure: laser treatment, cautery, or the use of medical grade silicone plugs. As each method has benefits and drawbacks, your doctor will advise the best treatment for you. The most popular treatment for the solution to your Dry Eye problem is the use of the permanent, yet removable, Punctum Plug. This treatment allows more of the natural tears to bathe the surface of the eye, providing long-term relief from the Dry Eye Syndrome. Typically, this is an in-office procedure. Your doctor may apply a simple topical anesthetic before gently dilating the tear duct. Next, the Punctum Plug is inserted, until the dome of the plug becomes flush with the surface of the tear duct opening, sealing the tear duct. Relief from the discomfort of dry eyes may be immediate in some, while others may experi­ence gradual relief. Patients wearing punctum plugs should take special care not to press or scratch on the tear duct area of the eye where the plug is placed as this may dislodge it. Should a plug become dislodged PLEASE DO NOT ATTEMPT TO REPLACE IT YOURSELF. However, to remove debris such as “sleep” from the eyes, use a mirror and gently wipe with a clean cotton swab. Doctors using punctum plugs in the treatment of Dry Eye Syndrome patients report a high success rate. For the low percentage of patients finding punctum plugs to be unsuitable, a simple procedure to remove the plug takes only a few seconds. The Dry Eye Syndrome leads to many discomforts. If you are experiencing any of the symptoms of Dry Eye Syndrome, please consider temporary or permanent punctal closure. It is known to be a safe, painless, quick, and effective treatment to restore those precious tears to your eyes, your window to the world.